Is Iran the World’s Leading State Sponsor of Terror? Could I thank the Frontline Media Club for holding this important meeting today. It is a great pleasure for me to be here. I have been closely following the situation of Iran for nearly two decades. During my time in the European Parliament, I chaired the Friends of a Free Iran intergroup for 10 years. The intergroup consisted of many MEPs from different political groups and different countries. Apart from numerous articles, in 2014 I wrote a book about the Iranian opposition, ‘Self-Sacrifice’, which has been translated from English to French and German. The title of this evening’s meeting is: Is Iran the world’s leading state sponsor of terror? This could be a very short speech as my answer to that question is YES! Before checking Europe’s policy on this, let’s see what the Americans think. The US Secretary of State Mike Pompeo published a report entitled ‘OUTLAW REGIME’ in which he listed the Iranian regime’s support for terrorists and the brutal way they repress their own people. Some of the most prominent Democrats have expressed their support for sanctions against the regime. Former Governor and Chair of the Democratic Party, Howard Dean, who is from the most liberal wing of the Democrats, has openly supported Trump for imposing sanctions against the IRGC. Former Congressman Patrick Kennedy wrote an article a few weeks ago under the title: ‘Sanctions Will Harm Only the Iranian Regime, Not the Iranian People’. On taking a hard policy on Iran, there is a bipartisan support in the US Congress. Sadly, this does not appear to be the case in Europe, where the EU’s High Representative for Foreign Affairs, Federica Mogherini, is a frequent visitor to Tehran, where she pays homage to the ayatollahs, on one occasion even donning a headscarf to offer submission to the clerical regime’s misogyny, then posing for selfies with the mullahs. Now she is engaged in an operation to find ways of compensating Iran for the sanctions that have been re-imposed by USA, in the hope that this will enable European business and industry to continue to sign lucrative contracts with the Iranians. Mrs Mogherini chooses to ignore the fact that on 1 July last year German police arrested Assadollah Assadi, a diplomat from the Iranian Embassy in Vienna, and charged him with terrorist offences. The day before, Belgian police arrested an Iranian couple from Antwerp after 500 gm of high explosives and a detonator were found in their car. They admitted Assadi had given them the bomb and instructed them to detonate it at the Iranian democratic opposition rally being held in Villepinte, near Paris on Saturday 30 June, attended by hundreds of political leaders including Rudy Giulliani, Newt Gingrich, Stephen Harper, the former Prime Minister of Canada and Bill Richardson – Former Energy Secretary in the Clinton administration and Presidential candidate. I was there myself. The mullahs have Ministry of Intelligence & Security (MOIS) agents implanted in every European embassy. Their job is to track down and eliminate political dissidents or enemies of the fundamentalist regime. Assadollah Assadi was a very senior Intelligence officer. There is little doubt that he was ordered by Iran’s Supreme Leader Ayatollah Khamenei and by the regime’s President Rouhani, to carry out the indiscriminate terrorist bomb attack, which would have killed and maimed EU citizens. President Macron of France has declared his outrage at this attempted terrorist atrocity on French soil and has imposed sanctions on Iran. I find it perplexing that while there was a justifiable international eruption about the horrific murder of Jamal Khashoggi in the Saudi Arabian consulate in Turkey with the finger of blame being pointed fairly and squarely at Saudi Arabia’s rulers, there has been little said about this attempted indiscriminate atrocity on European soil clearly ordered by the Iranian leadership. Of course, this was not an isolated incident. In October last year Danish police arrested an Iranian intelligence agent, Mohammad Davoudzadeh Lului and accused him of plotting to assassinate an Iranian opposition figure in Denmark. 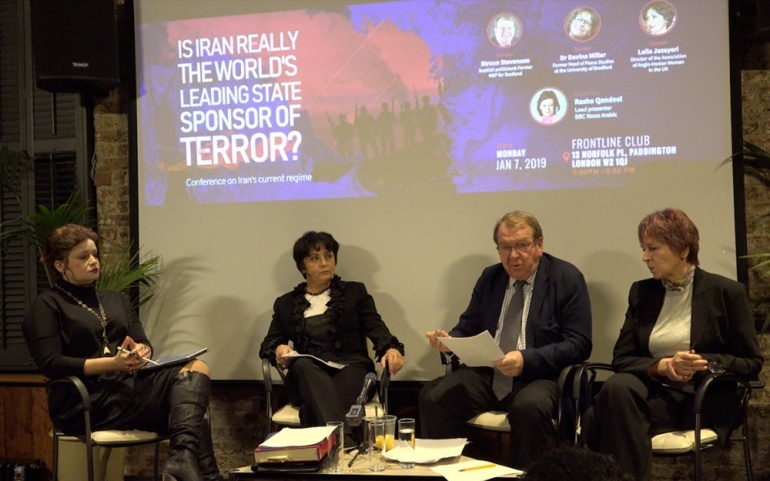 His active ties to the ambassador and the Iranian regime’s embassy in Norway once again proved that these embassies are hotbeds of terrorism and espionage, openly abusing diplomatic facilities. The Norwegian media even published a photo of Lului attending a ceremony in the regime’s embassy on the occasion of Nowruz – the Persian New Year 2017, sitting near the regime’s ambassador. Last month I visited the large compound in Albania, which is now the home to 2,500 Iranian dissidents, men and women who are members of the main democratic opposition movement – The Mojahedin e-Khalq (PMOI or MEK). These refugees had been living peacefully in Iraq for years in Camp Ashraf, after fleeing the murderous clerical regime, but found themselves at the mercy of the corrupt and vicious Iraqi Prime Minister Nouri al-Maliki and his puppet masters in Tehran after the withdrawal of US military forces. Military assaults and rocket attacks orchestrated by the mullahs left 168 dead and over 1700 wounded, but pleas for the Ashrafis to be rescued and airlifted to safety, masterminded by Mrs Maryam Rajavi, President-elect of the National Council of Resistance in Iran and assisted by an international campaign of prominent political leaders and supporters, fell on deaf ears. The EU, determined to pursue its policy of appeasement of the tyrannical Iranian regime, turned a blind eye to the repeated massacres of the defenceless PMOI members. Finally, the tiny country of Albania, which had suffered years of oppression under the communists, recognised the plight of the Iranian refugees and agreed to provide them with a safe haven in Tirana. A series of evacuations began from Camp Liberty in Iraq in 2013 and by 2016 the final airlifts saw all 2,500 surviving Ashrafis re-located to Tirana. The mullahs were outraged. They could not tolerate the PMOI setting up a new base in Albania. They hurriedly staffed their embassy in Tirana with a large team of spies led by an ambassador and first secretary who were both trained agents from the Iranian Ministry of Intelligence. Surveillance and terror plots targeting the Ashrafi refugees began. A series of attempted terror attacks masterminded by the Iranian embassy in Tirana, culminated in the arrest and deportation of several Iranian agents who had been planning to bomb a Nowruz celebration in Albania. This led to the courageous decision by Albania’s Prime Minister Edi Rama, only last month, to expel the Iranian ambassador and his first secretary on the grounds that they posed a threat to national security. But despite these repeated attempts to commit atrocities on European soil, Federica Mogherini thinks that a regime which sponsors acts of terror in Europe should be regarded as a friend and trading partner. Well I beg to differ! Iran, despite its rich, civilised and open culture, has now become an international pariah, its religious fascist regime condemned for human rights abuse and the export of terror, while its 80 million beleaguered citizens, over half of whom are under thirty, struggle to feed their families against a background of power outages, water shortages and food prices that have risen by more than 50%. It is not surprising that the uprisings, which have raged across Iran since December 2017, have targeted the Supreme Leader Ali Khamenei and President Hassan Rouhani. The angry protesters are not demanding that hard-liners should be replaced with moderates, a myth that still beguiles many western governments, who think there is room for gradual change. The chants of “Hard-liners, reformers, the game is over,” “Death to Hezbollah” and “Leave Syria, think about us instead”, have clearly demonstrated the people’s opposition to the fascist clerical government’s belligerent regional meddling and their demand for regime change. Iran’s descent into economic chaos can be traced directly to Khamenei and Rouhani. Their policy of aggressive military expansionism across the Middle East has seen them consistently pour men and resources into Bashar al-Assad’s murderous civil war, the genocidal campaign against the Sunni population of neighbouring Iraq, their support for the Houthi rebels in Yemen and their vast funding for the Hezbollah terrorists in Lebanon. Combined with the mullahs’ predilection for corruptly lining their own pockets, it is little surprise that the country with the world’s second largest gas reserves and fourth largest crude oil reserves is now facing economic meltdown and nationwide protests. Of course, the mullahs have tried to plead for international sympathy by claiming that the US sanctions are affecting the supply of food and medicines to the Iranian population. But Rouhani himself gave the game away in a speech on 10th November last year, when he admitted that the sanctions have not affected the supply of food and medicine. It is the mullahs’ own corruption and repression that has created the crisis in Iran. The so-called ‘moderate’ President Rouhani has presided over a brutal offensive on the protesters, sending in the regime’s Gestapo, the Islamic Revolutionary Guards Corps (IRGC), who have gunned down dozens in the streets and arrested over 10,000 protesters, many of whom have been tortured to death in prison. Striking truck drivers have been sentenced to death. Environmental campaigners have been sentenced to execution and one was recently murdered. Workers from Hepco, the Iranian company that provides heavy road construction equipment, have been sentenced to flogging and long prison terms for taking part in the protests. Rouhani’s government claims to represent God’s will on earth, yet regards women as second-class citizens, hangs people in public, condones torture, arbitrary imprisonment, eye-gouging, stoning, whipping and amputation. Amnesty International last August published a 94-page report entitled “Caught in a web of repression: Iran’s human rights defenders under attack.” It detailed 45 specific instances of what Amnesty described as a “vicious crackdown”. Indeed, the UN now has irrefutable proof that in 1988, when Rouhani was deputy military commander and a senior government figure, the regime coordinated the massacre of thousands of political prisoners in prisons across Iran, an atrocity that must rank as one of the worst crimes against humanity of the late twentieth century. Amnesty International recently released its report on the atrocity entitled: “Blood Soaked Secrets – Why Iran’s 1988 Prison Massacres are Ongoing Crimes Against Humanity.” The mass executions were carried out on the basis of a fatwa by the regime’s then-Supreme Leader, Ayatollah Ruhollah Khomeini. A ‘Death Committee’ of four senior officials approved all the executions, which Rouhani would certainly have been aware of. Nevertheless, Mostafa Pour-Mohammadi, a member of that ‘Death Committee’, was until mid-2017 President Rouhani’s Justice Minister. When his part in the murders became known publicly and he even admitted and boasted about his role, he was replaced by Alireza Avaie, who himself was a prominent executioner during the 1988 massacre. Avaie has been on the EU’s terrorist blacklist for years. How is it possible to describe Rouhani as a moderate and reformist, when he appoints known terrorists and executioners as his Justice Ministers? As the arrests and violent repression continue, the international community must not remain silent. The United Nations Security Council must adopt punitive measures against the regime. They must hold to account the perpetrators of the 1988 massacre of 30,000 political prisoners, most of whom were supporters of the PMOI. Many of these murderers are still in positions of power in Iran today. The international community must demand the release of the thousands of protesters arrested during the on-going uprisings and issue strong warnings against any torture or execution of these prisoners. They must demand the restoration of full and unhindered access to the internet for the Iranian public and importantly, they must express solidarity with the Iranian people in their bid for democratic change. It is astounding to me that with all of these atrocities, human rights abuse, proxy wars, sponsorship of international terror and dictatorial repression in Iran, we still see limited coverage in the press and what we do see is often on the side of appeasement and what the appeasers call “constructive dialogue” with the fascist clerical regime. Those who advocate this kind of “quiet, calculated diplomatic pressure’ in our dealings with Iran, should remember the catastrophic appeasement policy of Neville Chamberlain. Chamberlain’s softly-softly approach simply encouraged Hitler to go to war. Similarly, Obama’s Iran policy encouraged the regime to export its terrorism and aggressive meddling throughout the Middle East. It is worth noting that the UN has now tabled its 65th condemnation of Iran’s human rights record. Why is that not mentioned in the press? The UK’s Foreign Secretary Jeremy Hunt was in Tehran last month, telling the mullahs that we support the nuclear deal and oppose US policy on Iran. He seems to have ignored the mass protests that are taking place under his nose. Why do we continue to consort with the devil in this way? There is only one way to stop the current wars and conflicts in the region; adopting a firm line with the Iranian regime and supporting the popular uprising and the main democratic opposition movement, the PMOI/MEK. We must remain vigilant and on our guard against such false propaganda and we must always remember that only a firm and strong policy can restore freedom and justice in Iran and prevent more war in this troubled region. Liberty for the Iranian masses is coming. The overthrow of the mullahs’ regime is inevitable. Struan Stevenson was a member of the European Parliament representing Scotland (1999-2014), president of the Parliament’s Delegation for Relations with Iraq (2009-14) and chairman of Friends of a Free Iran Intergroup (2004-14). He is an international lecturer on the Middle East and is also President of the European Iraqi Freedom Association.